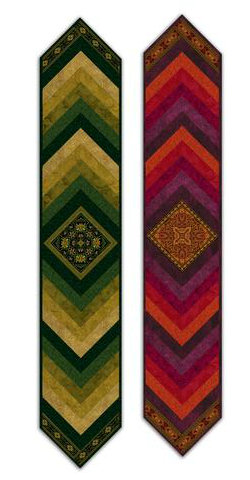 "This fast and fun project is suitable for quilters of all levels. The pattern steps you through creating the intricate-looking but easy-to-make center square. Here's the secret: it's just four identical triangles! Five beautifully shaded fabrics make up the "braided" strips. There's no tricky piecing or odd angles -- it's all straight-seam sewing. And the quilt-as-you-go technique means that when you're done sewing, the project is almost complete!"